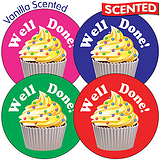 Sheet of 35 cupcake design stickers in mixed colours. 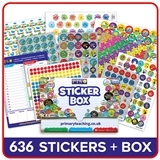 The stickers are 37mm in diameter and have a rub and smell varnish on them. 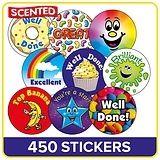 These multi sensory stickers have the fragrance is sealed in the 'encapsulated varnish' and is realised with a quick rub. Can be used on books, charts, bookmarks and jumpers. Cupcake Fact - Up to 2014 the largest cupcake weighs 1,176.6 kg (2,594 lb) and was achieved by Georgetown Cupcake (USA) 2 November 2011.